Structural Insulated Panels (SIPs) represent another choice for builders seeking alternatives for R-30 (or higher) walls for single and multifamily construction. Although a substantially different system than the more typical ICF construction methods, SIPs can achieve equally impressive results cost-effectively if the nature of the product, its variables, and its limitations are well understood by the designer and the builder. SIPs are a manufactured “sandwich” panel most commonly utilizing two exterior faces of oriented-strand-board (OSB) encasing a core of expanded polystyrene foam insulation (EPS). The material used for the outer faces and the foam insulation core can vary depending on the manufacturer and the desired properties of the final wall system. Alternate insulation cores include extruded polystyrene (XPS), polyisocyanurate and polyurethane. In addition to OSB faces, some manufacturers either specialize in, or offer as options alternatives such as plywood, straw board, and cement board. Panels with interior gypsum board or tongue-and-groove pine boards are also available but are easily damaged during transport and set and must be treated carefully. The overall thickness of the foam core (and thus the R-value achieved) is also variable and is typically available in dimensions closely mimicking traditional framed walls. Standard foam-core thicknesses are 3-1/2”, 5-1/2”, 7-3/8”, and 9-3/8”. The overall, nominal R-value of a SIPs wall is a function of its thickness and the type of core insulation used. Typically EPS foam is R-4 per inch, XPS is R-5 per inch, and polyisocyanurate and polyurethane are approximately R-6.5 per inch (the higher R-value cores are correspondingly more expensive). SIP’s are, as the name indicates, panels, and as such they are far more efficient if the building project they are intended for has been specially planned to be panel-friendly. What this entails is a building design that is simple in form without excessive jogs, bump-outs, non-90 degree angles, and where the envelope openings are planned to coordinate with panel dimensions. 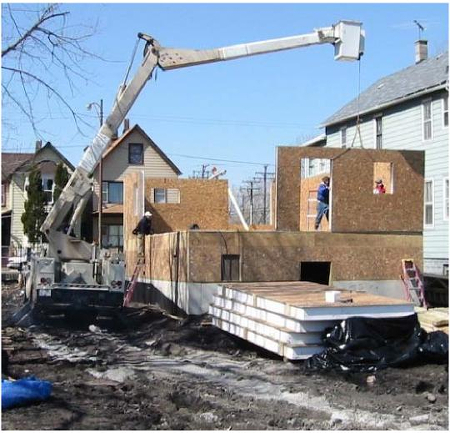 SIPs can be used for virtually any house design, but with a non-panel friendly plan, the amount of waste, internal posts, headers and structural panel slice lumber will quickly add up diminishing the cost and performance advantage of a more optimized design. The use of standard heights is equally critical in controlling costs and minimizing waste. Since the largest panel is available is 8’ x 24’ (based on the limits of available OSB manufacturing), horizontally placed SIPs have a maximum wall height of 96”. Correspondingly, vertically placed SIPs have a maximum width of 96”, but can be used full height to achieve 8’, 9’, or even 10’ high walls. Because of its more brittle nature, cement board SIPs are more limited in dimension than OSB SIPs, with typical sizes of 3’ x 8’, 3 x 9’, and 3’ x 10’ and are therefore always placed vertically. SIPs – Many home designs can be erected in a single day. For moderate-cost housing with 8’ ceilings, a 24’ long panel provides the best value, with the least waste, splices, and connections. For taller walls, a 9’ or 10’-tall x 8’-wide panel covers the most area with the fewest pieces. Large panels do have one drawback: a crane is needed to set them due to weight considerations. Small panels can be hand set by a crew without a crane. For most applications, SIPs are pre-cut at the manufacturer’s plant based on the home plans. These systems are typically automated and linked to in-house CAD departments that will create optimized panel layouts for homes. Headers, posts, openings and other features can be installed in the factory prior to shipment. The panels are then sequentially numbered (#1 being the first panel to be set, etc. ), and trucked to the job site for assembly. Many home designs can be erected in a single day. Overly complicated designs will require more time to assemble on-site, more custom site work, and will result in more material waste. For low-budget projects, uncut stock panels are also available. These can be appropriate for very simple, rectilinear plans where on-site cutting would not be unduly time-consuming. Site cutting SIPs is not difficult but does require specialized techniques and equipment due to the panel thicknesses and their non-monolithic nature. This is particularly true for thicker panels that are needed for R-30 walls. Although not normally a concern for vertical wall assemblies, SIPs have upper limits for temperature exposure based on both the limitations of the foam cores and on the adhesives used to bond the core to the skins. Above these temperatures, the core may deform diminishing the structural value of the assembly. Standard not-to-exceed temperatures for OSB/EPS SIPs are usually near 160°F. Different material assemblies will have different limitations, and should be confirmed early in the planning stage. Upper-temperature limit can be a critical issue in SIP-roof applications in hot climates, where summertime roof deck temperatures can easily surpass 160°F. Top and Bottom Plates. Inserted horizontally along the upper and lower edge of the SIP is a minimum of one 2-by plate. The bottom plate is site-installed prior to the panel being set and fastened to the slab or floor deck, with the bottom of the SIP ploughed to accept the foam width of 2-by plate. The foam-width top plate is installed at the top of the SIP wall assembly and acts to tie the top of the adjacent panels together much like a bond beam. A second full-width cap plate is then installed. Typically a 2-by member, the cap plate is secured to the top surface of the top plate and matches the full SIP thickness overlapping the facers on both sides of the panel (Figure 13). The cap plate overlaps the top plate joints at corners and overlaps non-corner top plate joints by 24”. Structural Insulated Panels use a significantly different structural concept than traditional wood frame buildings. Whereas wood frame construction is really a refinement of the ancient practice of post-and-beam construction using many small posts instead of a few large ones, SIPs are, in theory, a structural diaphragm capable of supporting a continuous lineal load without the benefit of posts. The vertical axial loads are instead transmitted uniformly across the top surface of the SIP and transmitted downward through the structural skins. The foam insulation cores act to hold the skins apart and in a constant vertical plane without significant bending. If the skins can be kept braced in the vertical position, the limiting factor becomes the compressive strength of the structural skins. Most manufacturers provide load charts for the prescriptive design of SIP wall systems in typical residential applications. In reality, SIP homes are a combination of panel-diaphragm loading and concentrated point loading. Each time the continuity of the panel surface is interrupted, such as with a large window opening, or if a point load is imposed from above, the point load will exceed the compressive strength of the area on which it is bearing, and a structural post will be required. Because structural posts inserted into SIP walls are fully braced with respect to their lesser dimension, the capacity of a given post will be higher in an SIP wall than in standard frame construction. SIP buildings can achieve exceptional levels of lateral strength, and are therefore an excellent fit for rigorous applications such as a hurricane or seismic risk zones. Even though the basic concept of SIP walls is compatible with high lateral loading, the building design must be configured to take advantage of those strengths. As with any wall system, there is no substitute for advanced planning in achieving the desired result. SIP buildings, taken to their most efficient configurations, will rely on the diaphragm action of the interior and exterior facings for most axial loading. This reliance on the structural facings means that, unlike typical frame walls, a built-in vertical load redundancy does not exist. If the facings are compromised, so is the structural capacity of the entire wall system. For this reason, appropriate material selections and proper detailing for moisture control are paramount. Bulk water and moisture vapor control are critical considerations especially in climates with significant rainfall. Drainage planes, weather resistive barriers, flashings, siding and trim, exterior caulk, and exterior mounted accessories and wall penetrations all require consideration in both planning and execution. Protection from insects and wood-destroying-organisms is also essential, as it is with typical frame construction. The normal best-practices for both methods are essentially the same including borate treated assemblies in high-risk areas, and elevate wood components away from grade and other moisture collecting surfaces. Conceptually and physically, a SIP building is considerably different from a conventional frame building, and assembling and finishing a SIP building does require some additional knowledge and skills. The variance in skills required is small, however, and basic frame construction skills translate easily to SIP construction. With a minimal learning curve, a trained framing crew will be conversant in SIP construction in a few days. Nearly all the materials and tools are the same, and any required new methods, tools, and techniques are variations on familiar tools and skill sets. Wiring. Installing electrical boxes and running wiring in the exterior walls of SIP homes is significantly different than in standard frame homes. The SIP industry, however, has developed wiring methods that are production friendly and, with minimal training, easily understood and adopted by the electrical trades. Typically, 1-1/2” horizontal and vertical wire chases are cored into the foam insulation at the time of panel manufacture. These horizontal chases are placed at 16” for outlets, and 44” for switches. Vertical chases are placed as required during the panel layout drawings to conform to the requirements of the plan. Major horizontal runs may also be run through the floor framing above or below the SIP wall with local vertical and branch horizontal runs extending to the wall devices. Plates and dimensional lumber splines must be site-drilled to align with the foam core chases. Electrical boxes are secured to the OSB skins with surface type fasteners with box locations just offset from chases so as to not block chase runs. The hole cut for the box should be just large enough to receive the box. After wiring, the gap between the box and the OSB skin should be sealed. Plumbing. Since all plumbing is discouraged in exterior walls, especially in very-high performance homes, no changes to standard practice are required for a home with SIP walls. Being continuously sheathed with wood structural panels, a continuous attachment surface is provided for a variety of standard residential sidings and trims. Appropriate siding materials include wood, fiber-cement, and vinyl. All wood should be back-primed, and the choice of weather-resistive-barrier should be carefully considered to avoid moisture drive and subsequent wetting of the OSB. Brick veneer assemblies over house wrap are also especially susceptible to vapor drive wetting of the structural sheathing. Weather protective material selections, detailing, and execution of these assemblies are essential. The inclusion of prescriptive language for SIP buildings in the IRC code is a big step forward for understanding the system for both builders and code officials. Although the 2009 IRC code is new and not universally adopted, it does provide a useful template for understanding what the code officials will look for when inspecting SIP buildings. Structural panel attachments, fastener spacing, cap plates, cutting and notching, headers and other considerations are addressed and will require the visual inspection for approval. As such these components must be available for visual verification or somehow documented to the satisfaction of the inspector. Prior to the more widespread adoption of the latest IRC code, additional engineering analysis may be required for more complicated plans or in particular risk zones or jurisdictions. SIP construction can be directly competitive with frame construction, especially when compared to other high-performance R-30 wall systems. The extent of changes required in SIP construction to achieve R-30 is less than the changes required to achieve R-30 in hybrid frame wall systems. The largest changed require is the thickness of the panel and associated accessories. Thicker panels will require higher shipping costs because they take up more room. Weight is not a significant factor as the largest contributor to weight (the OSB) remains the same. The larger panels will require some additional increment of time to set, but not a substantial increment. Beyond the learning curve for the electrician, wiring a SIP home is comparable to wiring a frame home, so once trained no additional cost should be anticipated. The walls of a simple SIP home can be set by a trained crew in a single day. Increasing the wall thickness to 8-1/4” or 10-1/4” will not significantly alter framing time, and, therefore, it will not extensively add to labor costs. The additional material cost will be incurred due to the additional foam core material utilized and the larger plates and posts. An approximate installed cost for the 8-1/4” SIP wall, including lumber, sealants and labor is $6.40 per square foot; a 10-1/4” EPS SIP wall of the same area would cost approximately $7.40 per square foot (LeRoy 2009). As in all cost examples presented, costs can vary tremendously with the region, material prices, and expertise and builders and trades. Nine Alternative Wall Systems For Your New Home Insulated Concrete Forms – FAQ Insulated Concrete Forms How Much Will a Home Built With Insulated Concrete Forms Cost? Wow, this post basically does have all you might want to know about insulated panels! I didn’t realize that panels with interior gypsum board or tongue-and-groove pine boards are available. The post mentioned that this type of panel can be easily damaged during transport and set and must be treated carefully. Is there a material that functions the same way, but isn’t as prone to damage during transportation? Very useful posts. This is actually a good and useful piece of information. Thanks for sharing this information with us.